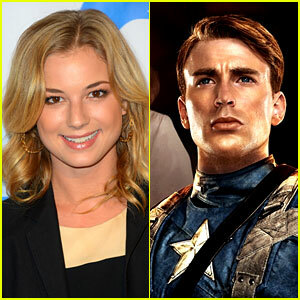 Emily VanCamp: 'Captain America 2' Female Lead! Emily VanCamp has reportedly landed the lead female role in the highly anticipated superhero flick, Captain America: The Winter Soldier, according to Deadline! The 26-year-old actress is reportedly in talks to play the character of Sharon Carter, the niece of Hayley Atwell‘s character Peggy Carter from the first flick. In case you don’t remember, the first film jumped into present time at the end. “It’s been an AMAZING week. Thanks for all the twitter love! ” Emily tweetedtoday (February 1). Pictured inside: Emily, her real-life boyfriend Josh Bowman, and theirRevenge co-stars Christa B. Allen,Madeleine Stowe, Gabriel Mann, Connor Paolo, and others filming a funeral scene earlier this week in Los Angeles. Good for her! I liked her on Brothers and Sisters and love her on Revenge.